Elbrus is an impressive extinct volcano located in the central Caucasus mountains, and dominates the skyline. It has two distinct rounded summits, East and West. At 5,642m, the West summit is 21m higher than the East which still has ruminants of the large crater nearly 250m in diameter. Due to the mountain’s volcanic origins it has rounded summits and easyangled slopes compared to many of the other surrounding mountains. 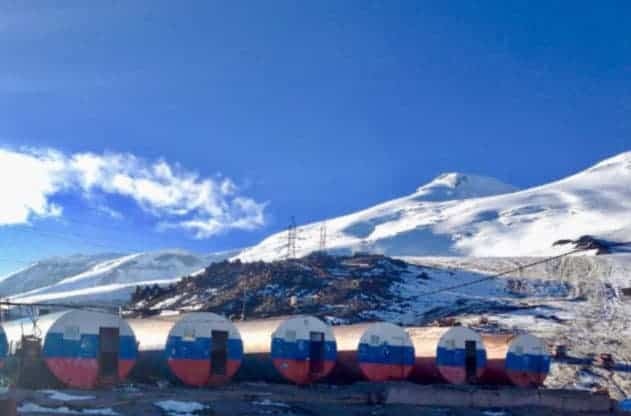 Our trip plans to ascend Elbrus from the south side, where there is a ski resort and a climbing hut. The South route is the most popular, fastest and most reliable route on Mt. Elbrus. However, don’t imagine alpine log cabins, wood burners and hot tubs – this is deepest south-west Russia! It’s pretty small with only a couple of lifts. At the top of these lifts, at 3,845m, we will use the famous “Barrel” huts. At the hut there is electricity so you can keep your tech kit charged. Our team of cooks will prepare a variety of meals with fresh eggs, meat and vegetables. To give you an idea you can expect to eat porridge, salads, soups, meat dishes. We can also provide vegan, vegetarian and gluten-freeoptions if required. Water is brought from the town and doesn’t require additional purification. The snow-line starts at around 3,600m on the south side, initially at a gentle angle, so crampons are often not required until higher up the mountain. On summit night we have the option to use the Snowcat (additional cost) to transport from the huts to Pastukhov Rocks at 4,650m, which still leaves a chunky summit day of 1,000m. From there we will be working together as a team walking on snow slopes and using ice axe and crampons to move efficiently but still need to take care as slips here can have consequences. There will be a team of up to 4 guides for summit night, depending on numbers in the team. Having the right kit is essential on any big mountain, especially ones where the weather is very unpredictable. Elbrus can feel very airy and relaxed on a perfect August day, but equally it can offer a harsh, bitterly cold experience more akin to a healthy battering on the Cairngorm plateaux but at 5000m! Planning and taking advice on the correct equipment will contribute as much to your success as proper training. You will need hooded winter weight down jacket, mitts, goggles and double skin mountain boots. In good weather you can use lighter gear, but if it’s a cold day, as it often is, you will have to turn back. We will supply you all the technical equipment such as ropes, ice axe, crampons and harness as there are some crevasses around so you don’t need to worry about that. Please ensure you fully read the High Altitude Mountain kit list and ask us if you have any questions about any of it. Having some experience and knowledge of winter walking will set you up well for your ascent of Elbrus. Plenty of hill walking, using crampons and ice axe and some expedition experience (eg. Toubkal, Kilimanjaro) would help, too. You will have at least 1 UK based International Mountain Leader (IML) with experience on the mountain working alongside our local team. will take in some surrounding sights. 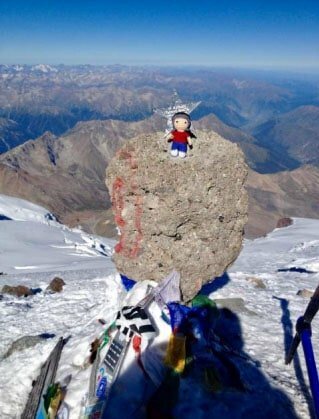 When we reach the summit of Elbrus we hope for far reaching views across the entire range as we watch the moonset and the sunrise, equally we could be in a gnarly blizzard! Either way standing a top of this European giant will fill you with a huge sense of pride and achievement and all for a brilliant cause. For the trip we are looking for a keen team of 8-12 who are up for the challenge. The dates for the trip are confirmed as 24th June to 4th July and we will be running a training weekend in February/March in Scotland so you get to know each other, practice using the winter equipment and get a feel for where you are with fitness levels, leaving plenty of time to up your game if needed!